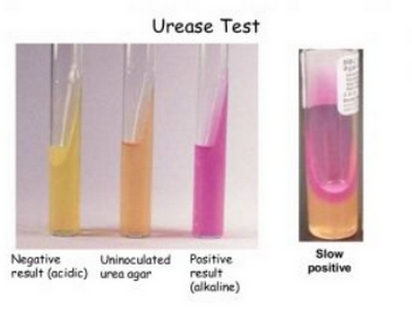 Urease test is a procedure used to find out the organism’s ability to split urea by producing an enzyme urease. 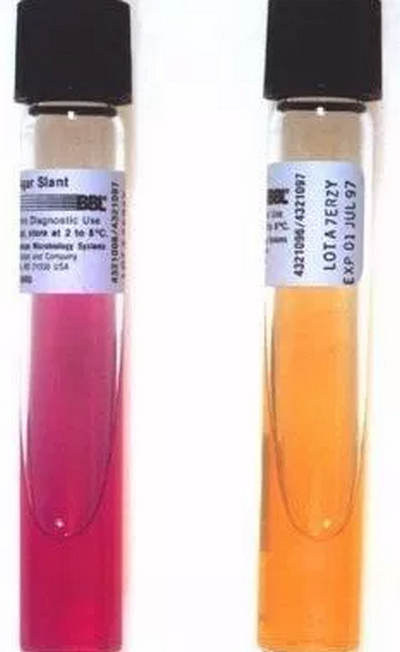 Image 1: Two test tubes set for urease test; the pink test tube is urease positive while the orange test tube is negative. Image 2: Four test tubes of urease test with varying degree of results. Decarboxylation of amino acids leads to the production of urea. Once urea undergoes hydrolysis, it produces ammonia and carbon dioxide. Urea is acidic but the formation of ammonia turns the medium into alkaline. What is urease test used for? It is used to detect the presence of H. pylori in tissue biopsy material. It is used to differentiate between Candida albicans and Cryptococcus neoformans. The former is urease negative while the latter is urease positive. It is performed to identify some Enterobacteriaceae species such as Klesiella and Proteus. The dry ingredients are dissolved in 100 m distilled water. Filter and sterile the dissolved ingredients. The agar is suspended in 900 ml distilled water. Bring to boil to make sure that the agar is completely dissolved. Autoclave for 15 minutes. The temperature is set at 121 degree Celsius. Allow the agar to cool down (50 to 55 degree Celsius). Add at least 100 ml of urea base to the previously prepared agar. The surface of the slant containing urea agar is streaked with an isolated colony with at least two drops from brain-heart infusion broth culture. Leave the cap but make sure it is loose. Incubate the test tube for 48 hours. You can incubate it for up to seven days. The ideal temperature is between 35 and 37 degree Celsius. Image 3:A rapid urease test can be done using a test kit. It is one of the commonly used procedures to check for the presence of Helicobacter pylori. It is widely used because the process is straightforward and cheap. Microorganisms like H. pylori and Brucella rapidly splits urea which may alter the test result. For complete identification, a biochemical and/or serological test should be done. Avoid using inoculum from a broth suspension to enable the growth and hydrolysis of urea. A false-positive alkaline reaction is observed if the culture is incubated for a long period of time. Do not put the urea agar slant in direct heat as urea is heat sensitive. Exposure to heat causes decomposition of urea. If you are testing Proteus species, make sure you check the inoculation for any reaction within six hours. Make sure you incubate the medium with a loose cap. Failure to do so can alter the result. Store the test tube in a dark place as urea undergoes auto-hydrolysis when exposed to light.